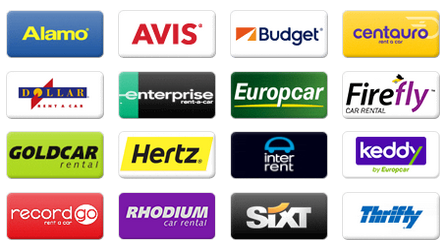 At autospain.co.uk you can compare approximately 49 different car rental companies in Spain. Find the right and best car for the right price. Where ever you are planning to travel, we will look for rental cars at large as well as small local rental companies. Compare before you book to find the best price and the best reviews. You can also search for special cars like mini cars, convertibles, mini vans, luxury cars, compact cars, Moped, mini, premium, 5 seat minivan, intermediate, luxury, compact, suv, jeep, 9 seat minivan, minibus, economy, 7 seat minivan, minivan, estate, convertible, fullsize, cargo van, standard, etc from Rhodium, Firefly, Dollar, Enterprise, InterRent, Flizzr, Keddy By Europcar, Sixt, Europcar, Thrifty, Surprice, National, Alamo, Goldcar, Avis, Budget, Hertz, etc in Spain. Since autospain.co.uk searches for prices at approximately 49 car rental companies you will find good prices and offers in Spain. For instance, we compare these car rental companies, Cooltra Scooter, CICAR, Hertz Dream Collection, Budget, Dickmanns, Hiper Rent a car, OK Rent a Car, Thrifty, Goldcar, TopCar, AutoReisen, Solmar, Record, Autos Aguirre, Dollar, Centauro, Class Rent a Car, Delpaso, Malco Rent a Car, Owners Cars, Autos Menorca, Europcar, Alamo, InterRent, Autoclick, Surprice, Niza, Orcar Canarias, Drivalia, Rhodium, King rent, La Palma 24, Nomadcar, Marbesol, Avis, Maggiore, Firefly, Hertz, National, Canarias.com, Autos Valls, Enterprise, Atesa, Faycan, Flizzr, Keddy By Europcar, Orlando, Sixt, ClickRent to find the best price in Spain. Find and look for cars in regions like Madrid, Canary Islands, Basque Country, Catalonia, Castille and León, Andalusia, Galicia, Valencia and in cities and towns like Madrid, Palma de Mallorca, Zaragoza, Murcia, Bilbao, Valencia, Barcelona, Málaga, Alicante, Las Palmas de Gran Canaria, Seville. 9 seat minivan / Minibus like e.g. Fiat Scudo, Mercedes Vito Traveliner, Mercedes Vito, etc. 7 seat minivan like e.g. Citroen C4 Grand Picasso, Volkswagen Touran, Ford Galaxy, Mercedes Viano, etc. Intermediate like e.g. Skoda Octavia, Ford Mondeo, Audi A3, Mercedes A Class, etc. Minivan like e.g. Volkswagen Sharan, Mercedes Vito, Mercedes Viano, etc. 5 seat minivan like e.g. Citroen C3 Picasso, Renault Scenic, Citroen Berlingo, BMW 2 Series Active Tourer, etc. Premium like e.g. Audi A6, Mercedes E Class, Mercedes C Class, Mercedes E280 CDI, etc. Compact like e.g. BMW 1 Series, Volkswagen Golf, Citroen C4 Cactus, Nissan Leaf Electric, etc. Luxury like e.g. Ferrari 458 Speciale, BMW 650 Cl Coupe, BMW 7 Series, Audi R8, etc. Economy like e.g. Volkswagen Polo, Toyota Yaris, Fiat Panda 4 x 4, Citroen DS3, etc. Mini like e.g. Peugeot 107, Mini Countryman, Renault Twizy, Citroen C1, etc. Moped like e.g. Scooter 110cc, Scooter 125cc, Scooter 125cc Electric, Scooter 50cc, etc. Convertible like e.g. Fiat 500 Convertible, Jaguar F-Type Convertible, BMW 3 Series Convertible, Mini Cooper Convertible, etc. Fullsize like e.g. Mercedes C Class, Mercedes E Class, BMW 3 Series, etc. Standard like e.g. Opel Insignia, Audi A4, Volkswagen Passat, etc. Estate like e.g. Renault Clio Estate, Mercedes C Class Estate, Ford Focus Estate, Skoda Fabia Estate, etc. SUV / Jeep like e.g. Mercedes G63 AMG, BMW X3, Jeep Renegade, Land Rover Freelander, etc. Cargo van like e.g. Fiat Ducato, Mercedes Sprinter, Volkswagen Transporter Cargo Van, Iveco Daily Cargo Tail Lift (20m3), and automatic transmission cars are car types and models that our site compares the prices of in Spain. Pay with credit cards from VISA, VISA electron and Debit, MasterCard and Maestro. Secure encrypted payment with Trustware and Digicert. Pay in the local currency or with Pound (GBP), Euro (EUR) or Dollar (USD) etc. The car rental business is extensive and there are many operators, some global and many local. Search and compare the large companies like, Keddy By Europcar, Rhodium, Firefly, National, Flizzr, Autoclick, Thrifty, Centauro, Enterprise, Sixt, Dollar, InterRent, Alamo, Hertz Dream Collection, King rent, Budget, Avis, Surprice, Nomadcar, Goldcar, Europcar, Hertz with the smaller local companies. Look for rental cars at airports like Seville-San Pablo Airport, Murcia-Corvera Airport, Palma de Mallorca Airport, Alicante-Elche Airport, Gran Canaria Airport, Zaragoza Airport, Barcelona-El Prat Airport, Madrid-Barajas Airport, Bilbao Airport, Valencia Airport, Málaga-Costa del Sol Airport, Murcia-San Javier Airport. It always pays off to compare before you rent and particularly if you are going to rent for a longer period of time. Renting from a smaller company can feel a bit uncertain but with us you can compare, understand and familiarize yourself with the terms. It is possible to rent a car for one way, called the one way rental. You collect the car in one place and return it somewhere else, e.g. another city or country in Spain. Compare car hire for a day, long term, one year, a whole month, week, weekend or for as many days as you wish in Spain. Easy car rental where every cost is included, no hidden fees and free cancellations/amendments up to 24 hours before you are supposed to pick up the car. When you have found what you are looking for, you can e-mail the prices to yourself and use them when you compare with other websites, or the companies themselves. We also have cheap rental cars on groups of islands like Canary Islands, Balearic Islands and islands like Lanzarote, Tenerife, Minorca, El Hierro, Gran Canaria, Ibiza, Majorca, La Palma, Fuerteventura, Formentera, La Gomera. Search and compare and have a fantastic holiday and trip. Fully comprehensive insurance. The price you see is the price you pay. Unlimited Mileage. Find car rental deals and discounts!